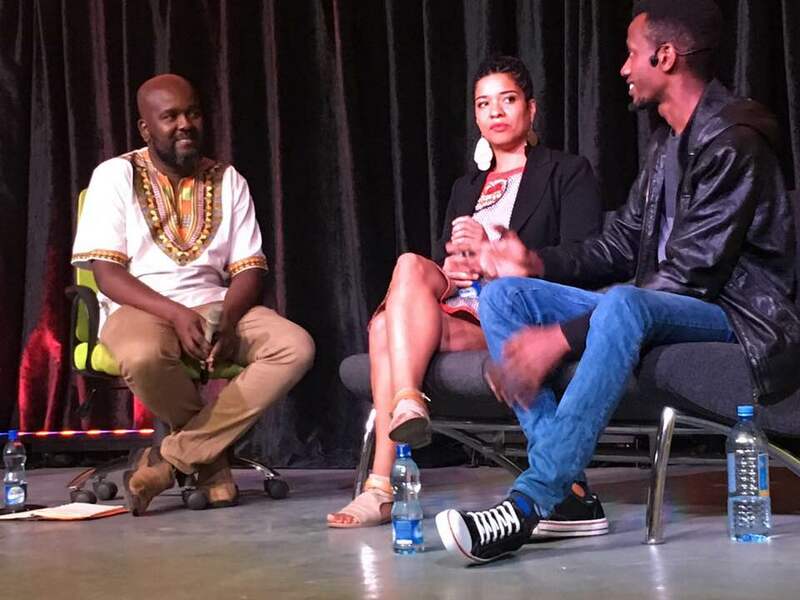 Olumide Popoola and Ngartia were stars on the stage at the Goethe-Institut Nairobi’s Artistic Encounters on Thursday September 13, 2018. The event was moderated by blogger James Murua. There was a full house at the Goethe-Institut at Maendeleo House in Nairobi for the September edition of the popular series “Artistic Encounters.” The project curated by Zukiswa Wanner usually sees two artists of different genres meet and share their art in front of an audience. It has had performers from Kenya, South Africa, Gambia, Nigeria, Germany, Zimbabwe, and Sierra Leone. They include artist Victor Ehikhamenor and poet Koleka Putuma, trumpeter Christine Kamau and poet Philipp Khabo Koepsell, novelist Lola Shoneyin and storyteller Maimouna Jallow, author Angela Makholwa and actress Patricia Kihoro. Also on the stage there have been novelist, short story writer and academic Pede Hollist and actor Hana Kefela, mbira player Prudence Katomeni and poet Adipo Sidang’, and novelist Niq Mhlongo and actor Nick Ndeda. On Thursday September 13, it was another full house for an event that has quickly made its name on the Kenyan artistic calendar. The event started much later than it usually does but when Ngartia got on stage he would weave a tale that left the audience spellbound. He was doing a one man show from the book When We Speak Of Nothing by German-Nigerian writer Olumide Popoola and he picked from its first fifty pages. In that book, there are two protagonists Karl and Abu, young men who are raised in London, UK and the scene he picks is one where they are attacked and given a beating of a dog (kichapo cha mbwa). The performance would end with Karl about to head out to Nigeria where he is to meet his father. The audience listened keenly and after this there would be a discussion where both the books author Olumide and the performer Ngartia spoke about the book and the performance moderated by James Murua. Ngartia spoke about why he chose the excerpt he picked, how the work has stretched him and how grateful he has been to have access to it. Olumide who had flown in from London specifically for this event spoke about the way the book came to be, her journey from poet to novelist and her impression of the performance she had just witnessed (very good). There were also a few questions from the audience one of whom had picked up on the fact that there were some references to LGBTQ. The evening then wrapped up when the audience members bought books and got signatures (and selfies) with both the author and the performer. Previous Previous post: The University of Johannesburg Prize 2017 shortlist announced. Next Next post: Lola Shoneyin on Gaborone Book Festival 2018 line-up.